Taylorsville is a small town about 60 miles Northwest of Charlotte in Alexander County. Passing through it seems like your typical town in the Piedmont area of North Carolina, with the usual assortment of box stores, supermarkets and restaurants. But Taylorsville has one thing that many other towns lack, that is Police Chief Tony Jones. All across America there is a vacumn in relation to the activities available for teenagers caught in the social void between the ages 16-21. Too old to want to be at home at night, and too young to cruise the bar scene, these teens are like folks without a country. And in many towns a group of these kids simply hanging out, or skateboarding in empty parking lots, can become a source of concern and complaint. Taylorsville is the only incorporated town in Alexander County. But there still isn't much to do at night. So, like teens everywhere, they needed to come up with a place to meet, and horse around a bit, with their friends. 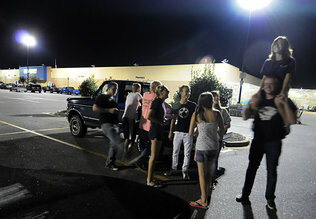 With such a large parking lot, and most teenagers having access to cars, Walmart seemed like a good idea. Now you might be thinking, "I've heard this before.... group of rowdies hanging out in a parking lot, spinning donuts and screeching tires, vandalism, etc." But you would be wrong. I had the same initial reaction when I saw the article in today's Charlotte Observer. It turns out that this is simply a good place to hang out with friends, exchange local gossip and arrange other activities. Both the store and the police allow this activity to exist unhindered, as long as there are no problems. And so far, so good. Apparently things have been going on in this fashion for the past 10 years with no major mishaps. Between 9 PM and 3 AM the kids come and go. Some do shop in the store, but most simply hang out away from the entrance, near the Garden Center, and exchange gossip or make plans. The Taylorsville Police Department passes through periodically to say hello and to see that all is well. This is where the leadership of Chief Tony Jones and the management of Walmart come into play. Together they have done something that is rarely done nowadays; they have treated a situation with common sense. They have shown their faith in groups of young people to hang out and have a good time without hurting anyone or damaging anything. And this faith will pay off in the long run. It will make more tolerant and sensible adults of the kids. It will also prove wrong the stereotypes of today's young people as rude and arrogant. And it also allows the Police to do their job more efficiently. Knowing where the town's kids are, and in many cases, who they are, makes it easier to seperate the good from the bad. Knowing who is who, and where they are, can make a Police Officer's job alot less complex. So, I just wanted to give a big "high five" to Chief Jones and the Taylorsville Walmart for their innovative and tolerant approach to "hanging out." Thanks for using your hearts and heads to deal with a common issue that is often perceived as a problem. In the long run this measured approach will pay off in ways that cannot even be quantified.